I normally go online with the intentions of blogging, finishing up my online chores. First thing I open is my mailbox to check on my messages. And then most of the mails in my inbox come from Facebook. So I'd then open my Facebook account and end up spending hours replying to comments, commenting on friends' status, checking on what my friends have been up to and viewing recent photos posted by friends. The only thing that I don't do with Facebook is playing the games like Farmville and all other apps that have become an addiction to many. By checking my Facebook account everyday or each time I open my laptop, I can say that I am one of those hooked with the social networking site! I chanced to watch the movie The Social Network a couple of weeks ago. It made me appreciate Facebook all the more and made me become thankful for the genius behind Facebook - Mark Zuckerberg. Millions of people are now connected with their friends and loved ones through this networking site. It's way better than Friendster, Multiply, Twitter, etc. It really had changed our lives virtually! Although not everything in the movie is accurate (especially the ex-girlfriend part as what the creator of Facebook claimed in the news), what is important is it made a nice representation of how Facebook came about. 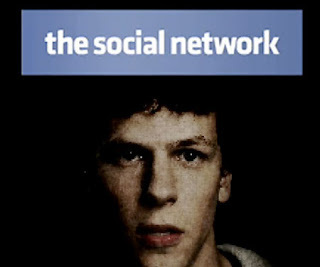 The Social Network, as we all know, is a movie about a young Harvard dropout, Mark Zuckerberg who turned a school project into a multi-billion dollar empire. It started with getting himself drunk after being dumped by his girlfriend. He made the "FaceMash" with the help of his best friend who provided him the algorithm. It is a site about voting two pretty girls in campus which crashed the University's server and got him under probation as a punishment. He became popular and met the twin brothers Cameron and Tyler Winklevoss who offered him a job as a programmer of their website, Harvard Connection. Zuckerberg ended up stealing the idea and made his own social networking site - TheFacebook which was financed by his best friend Eduardo Saverin. It gained popularity not only in Harvard but also in other schools in the US. It only expanded in other continents when Sean Parker, the co-founder of Napster, came along the way and also was the one who suggested the name - Facebook, instead of TheFacebook. Eduardo and Sean don't get along with each other. There were conflicts and drama between the 3 of them. I had a funny thought about having geeks as boyfriends because they have the bigger chance in becoming rich and famous! LOL! I haven't watch this movie yet but I will.....even if I know it's fiction.